What is the biggest poster possible? Over 40 years in the printing business has given us an in-depth knowledge of the very best in printing technologies. Here at PosterPigeon HQ we use state of the art, super wide HP Inkjet and KIP printing machines. Offering the latest in digital inkjet technology and using 8 colour, UV fade resistant pigment inks. These machines use spectro-photometers to ensure consistent and accurate colour matching, this gives you the very best quality printing at an amazingly low price. Our customers are blown away by the quality of the posters we print, if you'd like to see a sample, please contact us and we can send you one of our sample packs, so you can see the quality for yourself. Do you resize artwork for printing? We can easily scale your poster up or down to the required poster size as long as it is created in proportion to an "A" sized print. 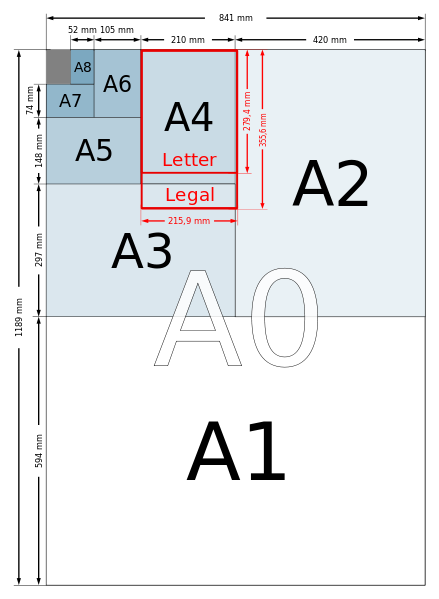 So for example an A4 poster will enlarge directly to A3 / A2 / A1 or A0. If you artwork is not in proportion to an A size, and this is very often the case with photograph files, don't worry, we can enlarge your photo to best fit the size that you need. Once we have done this, we may be left with some white areas of paper - select the "trim to artwork" option available on Standard or Premium Posters when placing your order if you would like us to remove this for you. We do offer bespoke sizes, we generally match your requirements to one of the 'A' sizes (listed above) and then trim your artwork accordingly. However if this is not appropriate, the maximum width we can print is 1500mm with no restriction on length, so we have a huge print range available. Here at PosterPigeon, we have some of the latest technology and over 30 years experience of trimming and processing print so we will do our utmost to help you. Please contact us with your requirements. 'Poster Lamination' and 'Poster Encapsulation' are terms that are often used interchangeably, which leads to some confusion! Technically in the print world, they are different processes with different end results. Encapsulation is the encasing of a poster totally within a resilient plastic film. The result is waterproof, wipe clean and very hard wearing. Great for hostile environments, outdoors or anywhere where humidity, or dirt levels are high and is highly recommended for posters that will be displayed outdoors or in busy areas such as school corridors. Lamination is the application of a plastic film - generally to one surface to improve the appearance of a print and to increase it's lifespan. Great for advertising and point of sale display boards. Both processes improve the performance of your poster - Encapsulation is more hard wearing but doesn't look as good, Lamination looks nice but is less resilient.